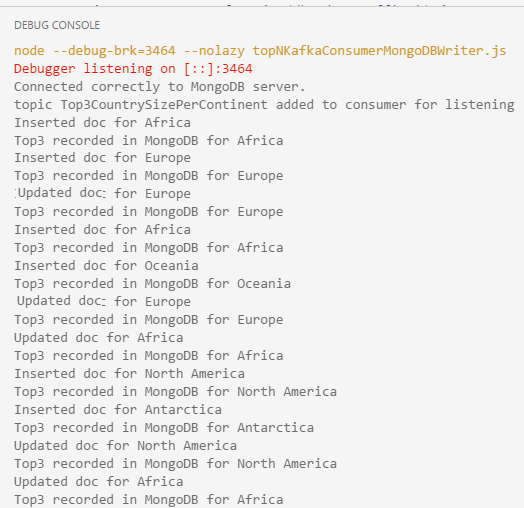 Then I do something a little more challenging: the Node.JS application consumes messages from an Apache Kafka topic and writes these messages to a MongoDB database collection, to make the results available for many clients to read and query. Finally I will show a little analytical query against the MongoDB collection, to retrieve some information we would not have been able to get from the plain Kafka Topic (although with Kafka Streams it just may be possible as well). You will see the Mongo DB driver for Node.JS in action, as well as the kafka-node driver for Apache Kafka from Node.JS. All resources are in the GitHub Repo: https://github.com/lucasjellema/kafka-streams-running-topN. Node.JS is installed, as is MongoDB. 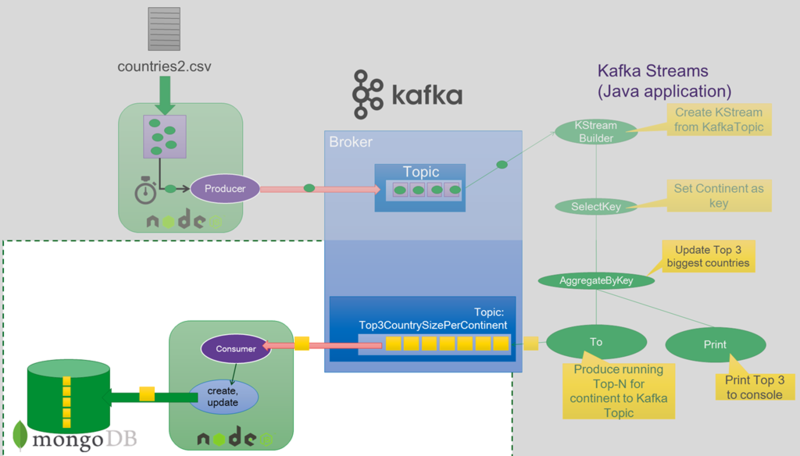 For the part where messages are consumed from a Kafka Topic, a running Apache Kafka Cluster is available – as described in more detail in several previous articles such as https://technology.amis.nl/2017/02/13/kafka-streams-and-nodejs-consuming-and-periodically-reporting-in-node-js-on-the-results-from-a-kafka-streams-streaming-analytics-application/. Start a new Node application, using npm init. 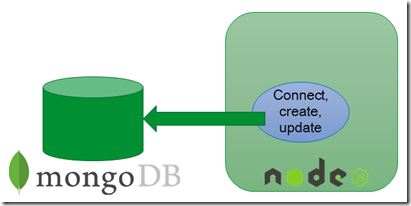 This simple Node.JS program uses the the mongodb driver for Node, connects to a MongoDB server running locally and a database called test. It then tries to update two documents in the top3 collection in the test database; if a document does not yet exist (based on the key which is the continent property) it is created. When the application is done running, two documents exist (and have their lastModified property set if they were updated). Note: I have used db.top3.find() three times: before running the Node application, after it has ran once and after it has ran a second time. Note that after the second time, the lastModified property was added. This application registers as Kafka Consumer on the Topic Top3CountrySizePerContinent. Each message that is produced to that topic is consumed by the Node application and handled by function handleCountryMessage. This function parses the JSON message received from Kafka, adds a property continent derived from the key of the Kafka message, and calls the insertDocument function. This function attempts to update a record in the MongoDB collection top3 that has the same continent property value as the document passed in as parameter. If the update succeeds, the handling of the Kafka message is complete and the MongoDB collection contains the most recent standings produced by the Kafka Streams application. If the update fails, presumably that happens because there is no record yet for the current continent. In that case, a new document is inserted for the continent. 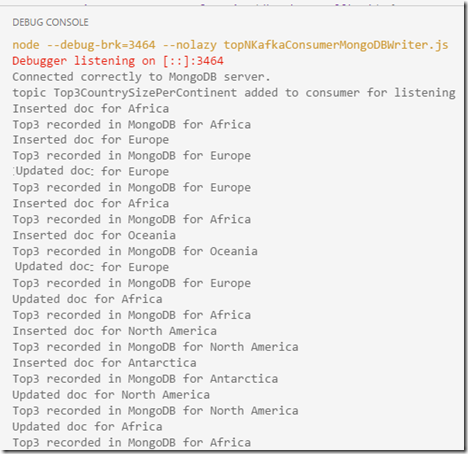 This program records each latest update of the top 3 largest countries for a continent in MongoDB. If a document does not yet exist for a continent (based on the key which is the continent property) it is inserted. The program ensures that the MongoDB /test/top3 collection contains the latest Top 3 for each continent at any point in time. The current set of top3 documents – one for each continent – stored in MongoDB can be queried, using MongoDB find and aggregation facilities. One query we can perform is to retrieve the top 5 largest countries in the world. Here is the query that gives us that insight. First it creates a single record per country (using unwind to join the nrs collection in each top3 document). The countries are then sorted by the size of each country (descending) and the first 5 of the sort result are retained. These five are then projected into a nicer looking output document that only contains continent, country and area fields. Thanks Lauri for the comment and the valuable guidance!